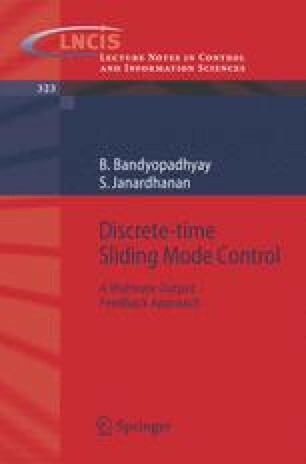 In recent years, the study of sliding mode control for systems with time delay in its state dynamics has received consideration. The delays present in a system can be broadly categorized into three categories. The input delay, state delay and output delay. Input delay is caused by the transmission of a control signal over a long distance. State delay is due to transmission or transport delay among interacting elements in a dynamic system. The output delay is to delay due to sensors. A lumped function based approach is adopted in  to design a sliding mode control law for systems with state delay. An added uncertainty is handled in . In , a control law has been proposed for systems where delay is present in both state and input. A state feedback discrete-time sliding mode controller for time-delay system has also been investigated in . In , an observer based sliding mode algorithm has been proposed. The algorithm handles systems with computational delay.